Writing in English is an adventure. 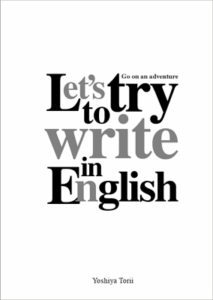 This is an adventure story of a man who went to an unknown world named “Writing in English.” Your adventure has already started since you took this book in your hands. This story would help you if you would like to write something in English or would like to tell something to a lot of people around the world. For example, they are business ideas, research results, your daily life, not to mention writing novels. You could deliver those things to people around the world if you wrote them in English. My experience would encourage you to write in English. Writing in English is an adventure, I think so with my experience. You probably wouldn’t be able to understand what I say, if you were a native English speaker. In the beginning, I would like to tell you about why I wanted to write my travel story in English. I am a Japanese, not a native English speaker. I had studied English and had liked to read aloud novels written in English as if I were the characters in the stories. I especially liked “Gulliver’s travel”, “The little prince”, and so on. So, I had been dreaming to write my original story someday. I had traveled over twenty cities in Europe. And I wanted to write an interesting story based on my travel experience. One of my favorite adventure stories was “The Alchemist” written by Brazilian author named Paulo Coelho. The adventure story encouraged me to try a new project and to pursue my dream. I began to believe that I could write my original fiction story as I read the novel over and over again. Would it be possible? I tried to write in English with passion. I thought that I had a certain English writing skill at least I could write a simple diary in those days. However, I couldn’t come up with proper words to explain what I wanted to tell. Writing needs rhythm not to mention passion. However, I had to check words when I tried to write every single sentence. Those tasks were taking my motivation away little by little. I couldn’t keep those emotions as I tried to write. Then I realized that I wouldn’t be able to write anything. It made me disappointed, made me notice my poor writing ability. If you asked me whether I had written any novels in Japanese before as a mother tongue. My answer was “No.” I was surprised myself. I wonder why I thought I could do that with such a poor experience. I found that I had never trained to write in English even if I had spoken English. When you speak with someone in English, you could make a stream of conversation with your body language, face expression, and your voice tone. You would enjoy conversation with someone if you talked about mutual topics even if you were not fluent in English. However, when it comes to writing, you have to write carefully as you follow the grammar properly. And you have to make a good stream of story as you choose proper words and sentences. The more I thought about those things, the more I couldn’t come up with any words. I was so disappointed like a man who failed his marine adventure. I was like the adventurer who had been attacked by a sea monster Kraken and had returned to a port desperately with a broken boat. I tried to find some advice on the Internet from a man, who had failed his own adventure like me. I searched some information from a man, who wasn’t a native English speaker and had tried to write a novel in English as a second language. Unfortunately, I didn’t find any advice from such an adventurer. Someone said that such an adventure was reckless. Another one said that it’s impossible. Actually, there are not many who want to write a novel even if in their mother tongue. So I couldn’t find any advice. I found some books: How to write diaries, How to write essays for examinations, and How to write business e-mail. They are very useful. However, books I tried to find were real adventure stories written by real adventurers who had been to the dangerous world: Writing in English. I wanted to know how to keep the motivation, wanted to know how to overcome difficulties while writing, wanted to know how to survive and get the treasure. I was looking for real adventure stories. I almost gave up to write my original travel story in English. One day I was reading the book The Alchemist, I found a very crucial thing. At first, The Alchemist was written in Portuguese, and it was translated into English. Then, why don’t I write in Japanese? After that I could translate into English. The little prince I had read was English edition as well. The original story was written in French. Honestly, I had found that I should do it first. However I wanted to write in English from the beginning. I didn’t want to admit a lack of my English writing skill. Finally, I accepted the reality and changed my mind. If I couldn’t, I should write in Japanese first. What’s more I found another crucial thing. If writing something in English is an adventure, I need to make up my mind to accept challenging difficulties. Now, I am standing on a start line to the challenging adventure, I realized. I started to prepare writing in Japanese immediately. I felt as if I were an adventurer to get back to the sea again with a small boat. Step2. Write a story in Japanese based on the plot. Step3. Translate the story into English. I cared about some aspects as I wrote the plot. The first one was that I put new things into the plot constantly. It keeps readers from being bored, even if the story written in simple words and sentence structure. It is a little difficult to change a story as you write. So you need to create the detailed plot before starting to write the story. I began to write the story in Japanese like writing a diary in simple words and sentences. Could you remember the diary, which you wrote as a child? You would have written it with a small vocabulary. You need to think about how to write an interesting and exciting story with those limitations: simple words and simple sentence structure. Then, I finished writing my original travel story based on the plot. It was a 40,000 letters long fiction story in Japanese. 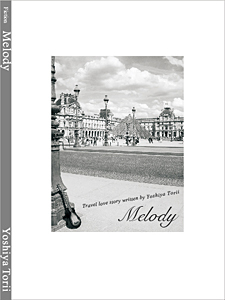 I finished preparation to write the English edition. I thought that I was now on a start line. I didn’t use any translation software. I really wanted to translate it on my own. It wasn’t school homework but a creative work. That’s why I had imagined English wards and sentences as I wrote the story in Japanese. I checked unknown sentences with dictionaries on the Internet and found how to translate from Japanese into English. I could find a lot of example there. Then, I googled the sentences which I had written, and checked whether it was grammatically correct or not. It had taken two months before I finished writing the plot in Japanese. Then, it took another two months that I finished writing the story in Japanese. After that I began to translate Japanese into English. One day it had been four months since I had started the translation work, I finally finished writing the first draft. It made me feel so happy. I wanted to jump up! I felt as if I were flying in the sky. I finally got my original story written in English in my hands. That was a 20,000 words long fiction story. I printed it out immediately. It was a bunch of paper. My dream has come true, I thought as I held it in my arms. I felt as if I were an author. I put it on a bedside table and fell asleep on that night, as I felt satisfied. Next morning, I began to read the story I had just finished writing on the previous night. I felt as if I just opened the treasure box. Keeping reading, I found something wrong. What do you think happened? There were a lot of spelling mistakes and grammatical mistakes. What’s more, the story was consisted of a lot of the same phrase, the same idioms, and the same words. I got really shocked even though I had finished writing the first draft. I wondered how I would be able to brush up this story with a lot of mistakes. I started to fix the draft as I read. Then I repeated it again and again. I wondered how many times I would need to read it. After having fixed it about ten times, I found I could read it easier than before. Did I get relieved? I didn’t think so. There were still a lot of mistakes. I wondered when I would finish doing such a task. I felt as if I were walking a maze in a jungle, as I didn’t know where I was. I desperately tried to find an exit from the maze. I had checked words, grammar, and example sentences as I had proofread. I had done the same work over and over again. I would have checked a lot of words with dictionaries more than several hundred times. While doing such a thing, my writing skill must have increased. That’s why I found the mistakes, which I hadn’t found the previous proofreading. The reality made me feel relieved. After repeating it about 10 times more, I found that the quality of the draft became better. I stepped forward the next stage. After fixing it grammatically, I began to brush up the content more naturally readable. Maybe you need to distinguish the polite words from casual words. When you asked something to a stranger, you would speak in polite words. And if you asked the same question to your close friend, you would speak in casual words. You would speak differently when you talk to your boss at work from when you talk to your close friends. So you need to choose proper words for the situations. What’s more, I didn’t use slang or trend words. The reason was that I wanted a lot of people to read it comfortably. And another thing I cared about was to avoid using the same words repeatedly. Maybe you should use some different sentences when you would like to explain similar situations. After proofreading like this way about twenty times, I realized that I could read my story easily and found that my writing work was almost finished. It made me satisfied. I got so excited on that night and printed it out, put it on the bedside table. Next morning, when I just started to read it, something strange feeling came into my mind. Have I seen the same situation? Something like this happened before, didn’t it? Oh, I remember that like this situation. That’s when I had finished writing the first draft. The fear attacked me furiously. Is it okay to write in my poor writing skill in English? However, I changed my mind, remembered that I was a real adventurer with positive mind. It is said that the population of non-English native speakers is much bigger than that of English native speakers. Maybe you should realize that you must have a much bigger opportunity to have your novel read if you wrote in simple English words. Readers of your story could be an Italian businessman going to an English school, or a Thai student studying at a college, or an Egyptian tour guide for people from abroad. I believe that if you wrote something in simple words, your story could get a much bigger opportunity to be read. The most important thing is whether your story attracts readers or not. Then, I realized that I achieved my goal, which I had once given up. After finishing writing the first draft, I fixed it and added some other parts into the story. Then it has become a travel story, 34,000 words long, set in 10 cities in Europe. That’s my adventure story. I got really tired. However I think it was a wonderful experience and it gave me three treasures in the end. The first one is the fiction travel story written in English. That’s exactly what I had been wanting. The second one is, English writing skills. I got a lot of experience through the adventure. Then, they made that improve. The third one is, my self-confidence. Though, I had once given up my try, I tried it again. Then I finally completed it. It made me much stronger. How do you feel about my adventure? I made it and I believe you can do it like me. Don’t hesitate to go on an adventure named “Writing in English.” If you would like to tell something to a lot of people all over the world, or if you had a great idea of something. Why don’t you try to write in English? The first step is the most difficult action. However, I believe you could get your own treasure after the adventure. Now it’s your turn. Step forward fearlessly. Someday your story could be read by a lot of people in the world. Your treasure must be waiting for you. Travel story set in ten cities in Europe: London, Dublin, Edinburgh, Amsterdam, Berlin, Zurich, Venice, Lisbon, Pontevedra, and Paris.